Taking joint supplements can help to ease the pain and discomfort that comes from living with chronic joint pain. The best joint supplements to reduce pain include vitamins and herbs such as turmeric, boswellia, cayenne pepper, and vitamin D. Some other joint health supplements contain compounds that help to reduce inflammation and pain in knees and other joints. One of the reasons to look for joint pain supplements is to reduce the need to take non-steroidal anti-inflammatory drugs (NSAIDs). Some of the best supplements for joint health don’t have many of the side effects that pain relievers cause. You may also find another benefit of taking natural joint supplements – your overall health may improve. This is because benefits from these home remedies for joint pain can help address a number of other health issues at the same time. There are many supplements on the market that claim to relieve joint pain and ease stiffness. But, do joint supplements actually work, and what are the most effective joint supplements you can use? In this article you will find out what scientific research says about vitamins and other supplements for bone and joint health. What Causes Joint Pain and Inflammation? Why Take Supplements to Reduce Joint Pain? Joint supplements include natural ingredients that help to lubricate joints, reduce inflammation, and soothe irritation. Many joint health supplements help to encourage good joint health so that there are less irritation and friction causing joint pain. A word of warning: always consult with your doctor before taking any supplement to avoid any adverse interactions with current medications you take. For example, turmeric and ginger which are mentioned in this article, possess natural blood-thinning properties. Therefore people who are about to undergo surgery and those who take blood thinning medications should take extra precaution. Also some supplements are not safe for pregnant women. Talk to your doctor first to be on the safe side. Let’s look in more detail at the best supplements to help with joint pain that are also backed up by scientific research. Turmeric is one of the most popular joint pain supplements because of its anti-inflammatory properties. The reason why turmeric works for treating rheumatoid and osteoarthritis is due to the compound curcumin. This is the part of the spice that gives turmeric its color, taste, and pain-relieving properties. You can learn more about the many reasons to take turmeric supplements for joint care, good cardio health, and healthy digestion. You can also add turmeric to your diet, as consuming moderate amounts of turmeric on a regular basis helps prevent arthritis pain. Turmeric is absorbed most readily into the body when combined with oil or with other substances such as black pepper. Please note that you should avoid or limit turmeric consumption when taking certain medications or having certain health conditions – find more information about it in this article. Ginger is closely related to turmeric and is another of the effective joint health supplements you can take to relieve pain. Ginger is good to take as a supplement for knee pain and also as a topical pain reliever. One study found that applying ginger oil to inflamed painful joints can help to reduce soreness in rheumatoid arthritis. (9) Ginger essential oil is one of the top 20 essential oils to relieve pain and inflammation. Find out more about how ginger can boost your health and also help address many digestive issues. You may also be surprised to learn that dried ginger can be just as good a fresh ginger. As with turmeric, you should avoid or limit ginger consumption when taking certain medications or having certain health conditions – find more information in this article. Taking omega-3 supplement regularly can help to naturally lubricate your joints and also fight joint inflammation. The most popular way to consume omega-3 is to take high strength fish oil supplement (like this one) or krill oil supplement (like this one). Find out more how taking omega-3 regularly can improve your joint health, heart health, and cognitive function. Fish rich in omega-3 fatty acids are also helpful in managing chronic pain conditions and are one of the foods you should eat if you suffer from arthritis. One of the best cartilage repair supplements is glucosamine, as it stimulates healthy cartilage formation. 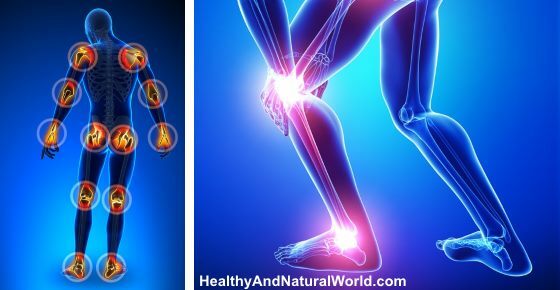 Find out more scientifically proven natural remedies for knee osteoarthritis. Chondroitin is another of the best supplements for knee pain and arthritis. Chondroitin is naturally found in cartilage and bone tissue, and taking chondroitin supplements can be good for your joints. One trial involving over 1,500 persons with osteoarthritis found that taking glucosamine and chondroitin supplements helped to improve their arthritis symptoms. Also, just taking chondroitin on its own helped to reduce joint swelling. One of the most popular joint repair supplements is SAMe because it stimulates the production of amino acids that help repair cartilage. Supplements to manage joint pain containing Boswellia can help to reduce inflammation in joints. You can use supplements for arthritis that contain devil’s claw because compounds in this natural substance help with joint pain. Researchers report that devil’s claw supplements can be as effective as NSAIDs but without the unpleasant side effects. Find out how to use devil’s claw to reduce the painful symptoms of gout, which is a type of inflammatory arthritis where joints become red, inflamed, and very sore. You may be surprised to learn that cayenne pepper is a supplement that helps treat chronic joint pain. Cayenne pepper contains a compound called capsaicin which contains anti-inflammatory properties. Capsaicin also has an analgesic effect that numbs nerves and treats pain. Learn more about the medicinal properties of cayenne pepper and how to use this spicy compound in many home remedies. One of the best vitamins for joints and relieving joint pain is vitamin D as it is necessary for bone and calcium metabolism. Before taking this vitamin to help with joint pain, it is important to take a blood test to check for levels of vitamin D.
Did you know that having adequate an amount of vitamin D is also essential to prevent developing many chronic diseases? Avocado contains many minerals and vitamins for joint health and reducing inflammation. Extracts from soybean oils are combined with avocado extracts to create a joint health supplement for arthritis. You can also find out how adding more avocado to your diet can help to reduce inflammation in your body. One natural supplement that acts as joint pain medicine is stinging nettle supplements. You can also use stinging nettle supplements to help naturally treat the symptoms of hay fever and other allergy symptoms. Licorice root extracts are a powerful anti-inflammatory supplement for good, pain-free joint health. Learn more about the amazing medicinal properties of licorice root. Juniper extracts from the bark and berries of the juniper tree can help to reduce inflammation and treat a number of health complaints. One of the many joint pain supplements that have scientific backing is burdock. Burdock contains anti-inflammatory compounds that can help alleviate chronic joint pain.